The active expansion of the faculty in recent years has been accompanied by the addition of several forefront research facilities, discussed below with their respective research programs. 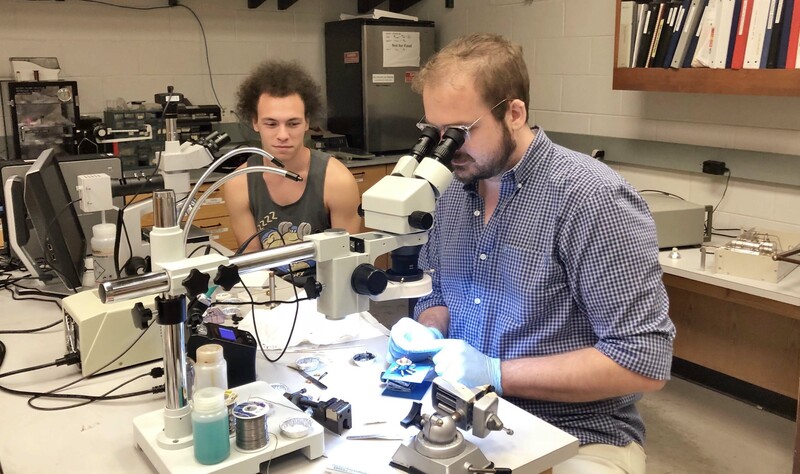 As an example, the National Science Foundation granted $1.3 million, with the State of Florida providing significant additional funding, for the Microkelvin Research Laboratory which has been completed and which is dedicated to the study of quantum phenomena at ultralow temperatures. Fabrication of research equipment is carried out by members of the departmental machine shop. This well-equipped shop employs six full-time instrument makers and machinists who do work of excellent quality. The Department also has Cryogenic Services whose duties are to supply liquid helium to the research labs in Physics, Chemistry, Astronomy, Material Sciences and the Brain Institute. The principal departmental building (Physics Building), contains classrooms, offices, teaching laboratories, and a number of research laboratories. Other research laboratories are located in three nearby buildings; the Nuclear Sciences Building, and the Microkelvin Research Laboratory. Includes research in Astrophysics Experiment and Theory. The importance of biological systems together with their complexity, has made biological physics one of the fastest growing subfields of research. Interdisciplinary research is increasingly important for the development of advanced materials and future nano-technology. Includes research in Condensed Matter Experiment and Theory. Studies of materials at the lowest attainable temperatures provide key insights into the underlying physics of modern materials whose applications often lead to new technological breakthroughs. Includes research in High Energy Experiment and Theory.